Bullmastiffs may be big, stocky dogs, but they are docile creatures and very quiet – they hardly ever bark. That said, they are endlessly devoted to their owners and make great guard dogs. Bullmastiffs are alert and powerful dogs and, while they are unlikely to attack, they can and will knock an intruder to the ground and hold him there. They need strong human leadership and consistency in their training, but are sensitive dogs and do not respond well to aggression from their masters. When properly socialised, they are gentle and patient with children and other dogs. The breed originated in Britain, by crossing 60% English Mastiffs with 40% Old English Bulldogs. Evidence of Bullmastiffs dates as far back as 1795, but they were only officially recognised by the English Kennel Club as a purebred dog in 1924. Mastiffs can suffer from various genetic disorders, such as cancer, mast cell tumours, hip and elbow dysplasia, eyelid problems and boils on the lips. They are also prone to bloat and gain weight easily, so should not be over-fed. 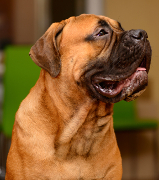 More information about the history, health and temperament of the Bullmastiff can be found at The British Bullmastiff League and Bullmastiff Rescue and Adoption UK. By joining this group, you club together with other Bullmastiff owners to get a great deal on pet insurance for your strong and sensitive guardian. Great news: £15 cashback* for you on VetsMediCover's Gold, Platinum and Diamond Pet Insurance, on top of a 10% online discount. It’s an exclusive offer that you won’t find anywhere else. A straightforward pricing approach that gives great value for your pet, with an additional £15 cashback* on top of a 10% online discount! "Fantastic quote, much cheaper than petplan!!"